There are some Chinese snacks/desserts that are eaten all year but some are reserved for Chinese New Year known as the special occasion snacks/desserts and this is definitely one of those. 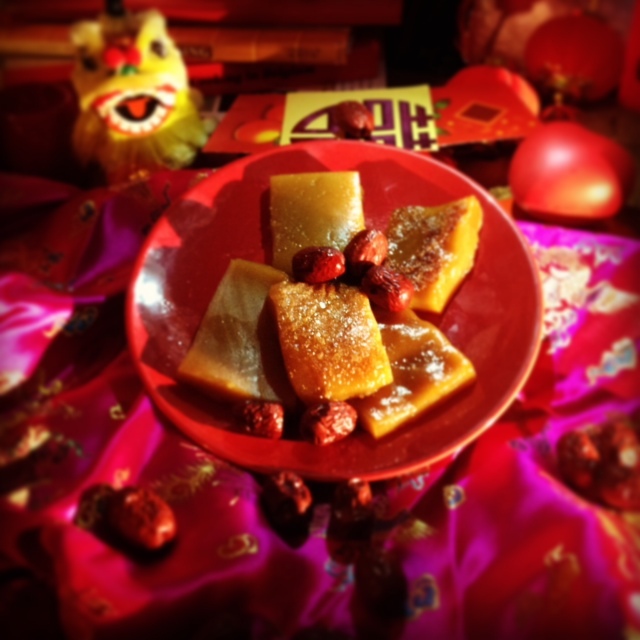 This popular yet traditional, sticky and sweet cake symbolizes of raising oneself taller in each coming year 年年有餘. The word 粘 (teem) means sweet and is identical in sound to 年(neen) meaning a year, and the word 糕 (go) meaning cake is identical in sound also pronounced as (go) 高, meaning high or tall. 年 糕 (Neen Go) sounds identical to 年高 (Neen Go) implying promotions at work or prosperity year after year. Hence Neen Go is a popular gift item during the New Year period. 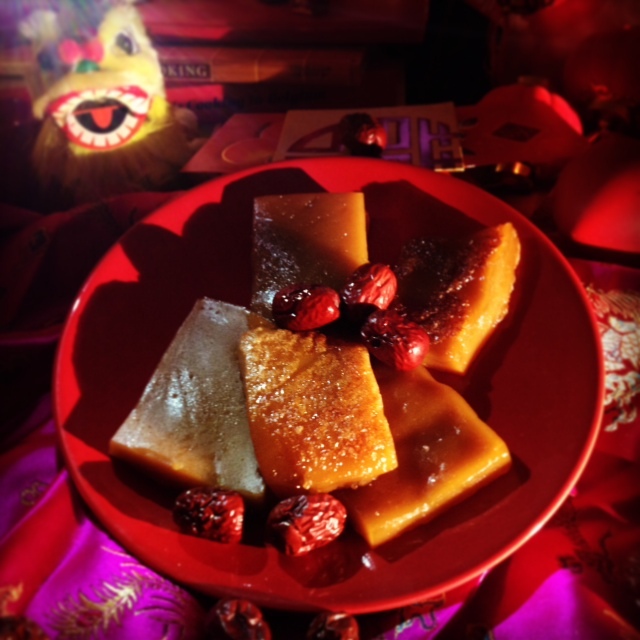 During Chinese New Year, families would make snacks/desserts and especially neen go when they visit each other Bai neen 拜年 bringing them the symbolize meaning and good will to the families. 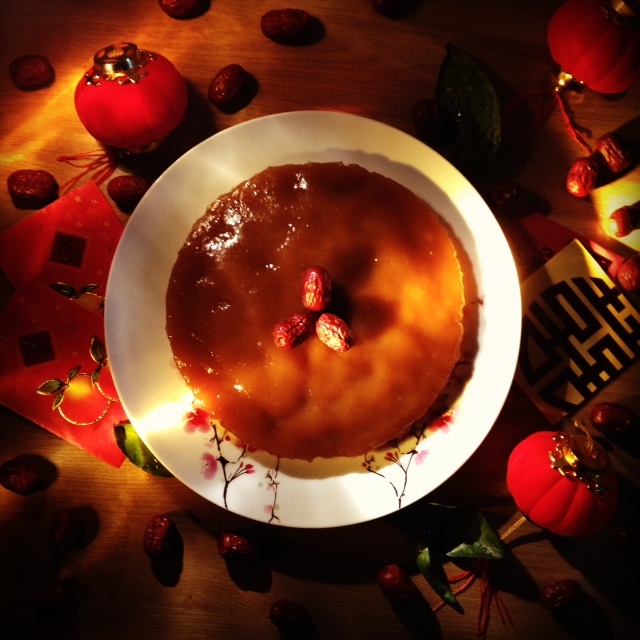 Chinese people eat a lot of sugary desserts during the New Year as sweetness in foods usually symbolises a sweet life ahead and blessing for the future. This “cake” is sweet in taste but the texture is something else! Don`t be fooled by the word cake! Unlike the usual soft, spongy cake this “cake” is actually a soft, non- doughy, sticky, fudgy, caramelised texture piece of amazing slab. As the cake cools down after steaming it will become hard. You just need to slice it and repeat the very last method step to reheat it before serving. These slices are always served warm, pan fried to a golden crisp on both sides. You can even dip/ coat the slices in egg and then pan fry the slices. This is at the last stage. • Add water, sugar slabs into a pot, heat on a medium heat until sugar lumps dissolves completely. This should take 7-8 minutes. Set aside to cool for 30 minutes. • In a mixing bowl, add in glutinous flour and the cooled sugar syrup. Mix the batter with or without an electric whisk until it forms a smooth batter. • Grease a heat proof circle container or a circle foil tray with oil. Pour the smooth batter into the container and steam on a medium/high heat for 1 hour. Set aside to cool for 20 minutes before cutting into slices. • Bring a pan to a medium/low heat. Add a little oil, place the cut slices into the pan, heat both sides for 1-2 minutes until golden brown. Or Dip the slices into a bowl of beaten egg, pan fry each sides for 1-2 minutes. Enjoy! Oooh lovely. Yum yum and happy new year!